Tung-Sol 6550, As the original designer of the 5881 and 6550 power tubes (1950's), Tung-Sol was the preferred source for early musicians and audiophiles alike. 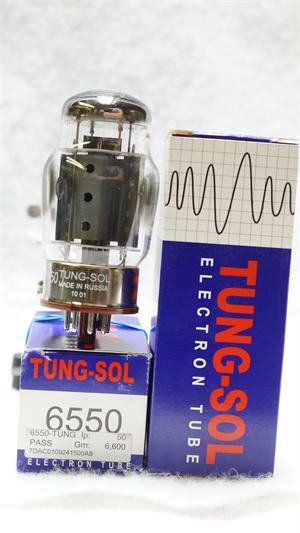 Strongly committed to quality manufacturing, Tung-Sol tubes have always been known for their reliability and great tone. Today's new production Tung-Sol tubes are constructed with the same commitment to quality and reliability. Assembled by hand in the Reflektor factory in Saratov, Russia, new production Tung-Sol tubes reflect the best in vintage Tung-Sol construction with unsurpassed tone and reliability.